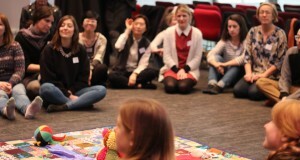 The first gathering of the London Early Years Music Network (LEYMN) took place at City Hall on Thursday 28 February, with over 20 members, from founder members through to those new to the network, in attendance. Early Years is a priority for the Mayor so it was valuable to hear from Magda Balicka (Principal Policy and Projects Officer for Early Years) about how the new strategy is being developed. In his manifesto, the Mayor pledges to make childcare more affordable and accessible with a strategy that delivers for business and workers. The aim is that children are able to learn well in the early years so they are ready for school and that childcare is not a barrier to work. Underpinning this are a number of new initiatives including the development of early years ‘hubs’ in Barnet, Newham, Merton and Wandsworth. There is also an emphasis on upskilling the existing workforce and developing Early Years professionals to improve their leadership, management and business skills. Attendees were very interested to hear thoughts from Magda about how music could feature in any programme of training and how the arts can be valued in these settings. You can download the whole presentation here. There was also a brief update from Tim Spires, Senior Policy Officer, Cultural Education and Music, Culture and Creative Industries, outlining developments in the Mayor’s cultural strategy which has an emphasis on access and inclusion. Although there is no specific focus on Early Years there are many opportunities for families to access a range of music opportunities across the city. Becky Dixon, Sound Connections Early Years Coordinator, led a discussion with three of our Early Years Apprentices, including Jenny Milway who talked about the mentoring, shadowing and training opportunities that she has been taking part in as part of the scheme. The 2019-2020 scheme will be launched in the next couple of months, so do make sure that you sign up to our newsletter here to find out more. With over 500 members LEYMN is a significant voice in Early Years music education in the capital and is part of a wider programme of activity that includes training, funding and other support. Joining is open to anyone working in Early Years and Music – signing up is simple and can be done via the Facebook group here.